It's only May, but that hasn't stopped me from thinking about the start of the archery deer season in September. 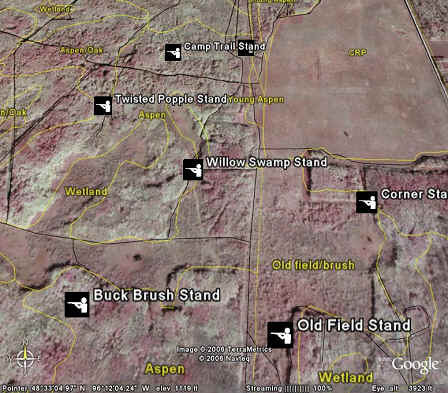 With a few clicks on the keyboard of my home computer, I can bring up my virtual deer camp, represented by deer stand locations, cover types, wildlife openings, trails and aerial photography. For years, I've been developing GIS data to represent deer camp on hard copy maps. Now, I can easily share a digital representation of deer camp with the rest of my hunting companions via free 3D geospatial information viewers. Motion detection cameras, GPS, computer mapping, digital deer camp logs and other high tech jargon is starting to work its way into my deer camp, as well as many other deer camps. It's not too surprising in this information-hungry society. I guess planning a hunt with maps isn't new. I'd imagine cave men drew out maps in the soil to plan how to ambush game. Looking at the high-tech maps has just become more entertaining and just a bit closer to the real thing. With digital maps, one can pull up more information about a single feature of interest on the map. For example, how many deer have been spotted from the Buck Brush Stand, at what times of the day and what days of the week? Does the Buck Brush Stand hold up to its name by giving the lucky hunter a good chance at shooting a buck or a BIG buck? Visualizing deer camp from the air gives my hunting companions a way to determine the best location for a new deer stand by seeing "funnel" areas of narrow dense cover types and edges along open fields or wetlands and dense woody cover. Below are several links to high tech tools that I've used or considered using for my deer camp. You may even find some of them useful for your work activities! No matter how high-tech I get, I just can't beat relaxing at my real deer camp. As I write this article, I'm listening to spring peepers and chorus frogs keeping a methodic melody, a pair of sandhill cranes trumpeting in the distance and Ted Nugent jamming the Fred Bear song on my laptop computer. If you'd like to discuss this idea, contact me at: cscharenbroich@yahoo.com.